Adorners are WPF elements that float on top of the design surface and track the size and location of the elements they are adorning. All of the UI Cider presents to the user, including snap lines, grab handles and grid rulers, is composed of these adorners. Adorners can contain any control, and an adorner can be associated with a task so they can participate in Cider’s commanding mechanism. Adorners can also get focus and be treated just like normal WPF elements, because that’s what they are. The grid lines, the anchor lines, the grid information, the grab handles... all are done with adorners. One of the cool things is that Cider uses the same infrastructure that we expose as extensibility points for control developers. This allows us to work with and get validation of the extensibility points we ship to customers. So what does the code look like to write one of these things? I'll go over the high level details around writing a control that has 2 adorners. Note that if you want to try this at home, you'll have to wait for the next CTP. I'll be blogging about getting this sample working with the CTP when it becomes available. In the screen shot below, the Slider is an adorner on the button as is the little square in the upper right hand corner. The slider adjusts the yellow gradient stop to be the position where the slider is and the little square pops a dialog when clicked. 1) The first step is to decorate your Control such that it knows that there is an attached adorner. 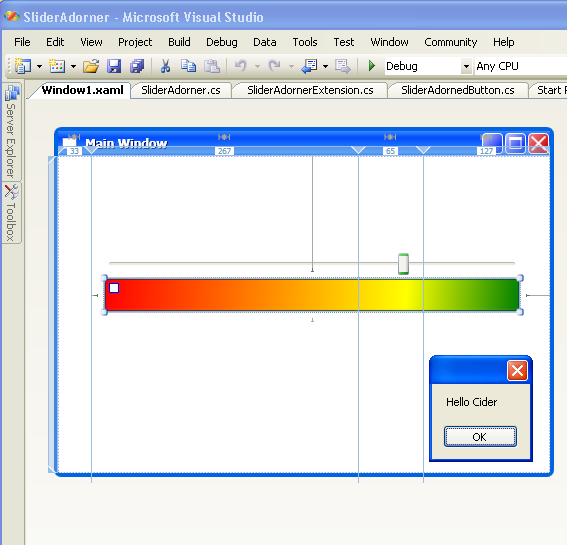 The Extension attribute is used to attach the SliderAdorner to the SliderAdornedButton class. Each group of Extensions have an ExtensionServer which manages its Extensions and can request and publish services, listen to events etc. ExtensionServers exist for the lifetime of Cider and are also a Cider extensibility point. In this example, because the SliderAdornerProvider derives from PrimarySelectionAdornerProvider which has an associated ExtensionServer (AdornerProviderExtensionServer), we don't need to write one. PrimarySelectionAdornerProvider is a Cider provided class that activates the adorner when the control that the adorner is attached to is the primary selection on the design surface. // for sizing and layout support. 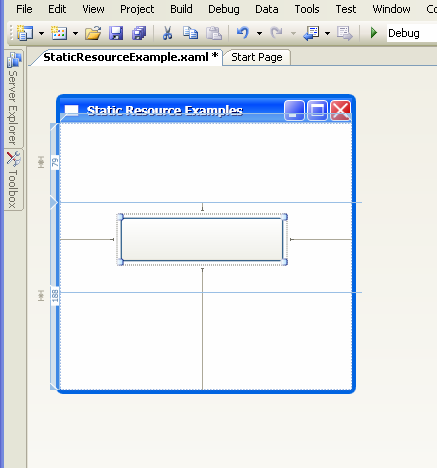 A Rectangle is instantiated, its position is set and its added to the AdornerPanel. // fired when we click on it. Essentially, the OnOpenPopup method will be called when the Rectangle adorner is left clicked. Here you'll notice 6 calls to AdornerPanel methods that are setting up the resizing and repositioning behavior of the adorner relative to the control it adorns. We're still working on these APIs, however the key things to notice are that the Slider adorner will stretch horizontally to always be the same size as the control it adorns, it will not stretch vertically and its positioned above the control it adorns. That's it! Your first adorner. Obviously there are a lot of details and functionality that was glossed over, I'll be drilling down into various parts of our extensibility mechanisms in the coming weeks. Stay tuned. Co-authored by Jim Nakashima and Timothy Wong.